Besides buying groceries, you'll also be able to buy auto insurance through Wal-Mart. Wal-Mart will soon start offering auto insurance along with vegetables and garden supplies. The nation's largest retailer said Wednesday it is partnering with AutoInsurance.com to provide customers with "a one stop shop" for their auto insurance needs. Wal-Mart will not sell insurance, but its customers can click through a link on walmart.com, or go to autoinsurance.com directly to get competing quotes from several car insurance providers such as Progressive (PGR), Esurance and Safeco to choose the policy and price that best fit their needs. Wal-Mart will also promote the service via displays in its stores. The service is already available in eight states -- Arkansas, Louisiana, Mississippi, Missouri, Oklahoma, Pennsylvania, Tennessee and Texas. 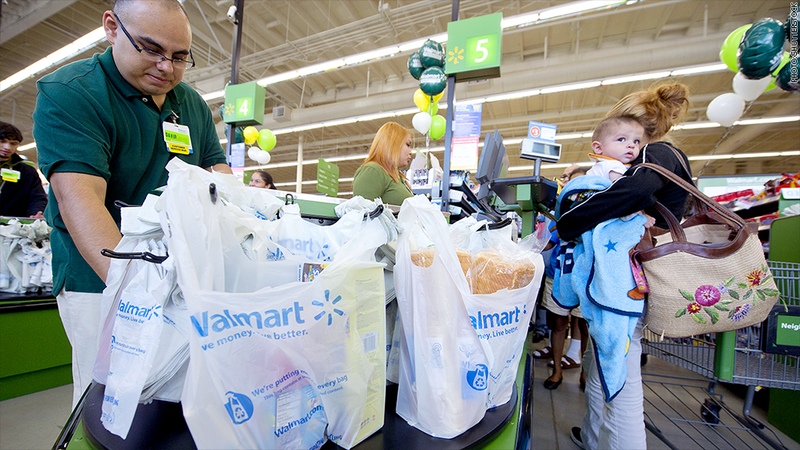 Wal-Mart (WMT) plans a nationwide rollout in the coming months. Wal-Mart said the service will save customers money. The company cited a pilot program survey it conducted last year in Pennsylvania, where customers who purchased policies from autoinsurance.com on average said they saved $1,168 a year. "We are always looking for ways to reduce complexity, increase transparency, and give everyday low prices to Wal-Mart shoppers," said Daniel Eckert, Wal-Mart's senior vice-president of services. Eckert also stressed the simplicity of the site, which is able to retrieve information from a customer's current policy and automatically fill in most of the necessary coverage information. Wal-Mart said the service originated from talks with Tranzutary Insurance Solutions, a New Jersey-based insurance broker, that runs the site. The announcement is the latest in Wal-Mart's aggressive move into financial services recently. Just earlier this month, the giant retailer announced it was entering the money transfer business to compete with the likes of Western Union (WU) and MoneyGram (MGI). Through the service, customers can transfer money to each other within Wal-Mart stores around the country for a fee that is relatively lower than competitors. Much of Wal-Mart's financial service offerings are targeted at people who do not have access to bank accounts, because they either cannot afford the high fees, or do not have stable enough jobs to be able to keep a minimum balance. Wal-Mart also offers check cashing and prepaid cards at its stores. In addition, it has partnered with American Express (AXP)to offer Bluebird, a debit and checking alternative that don't require a minimum balance, or monthly maintenance fee. This is also Wal-Mart's way of countering a slump in sales in recent months. In February, Wal-Mart reported a drop in profit and same store sales and also lowered its outlook for the year on concerns about higher taxes and health care costs.